Let me start off by saying that I know I write a lot about beauty products but I don't classify Royally Pink as a beauty blog. I like writing about beauty but I don't want to get myself into a niche because there are so many other things I enjoy writing about. With Black Friday & Cyber Monday behind us, along with some beauty blogger mail, there are a lot of new products that need talking about. Instead of spreading it across the next few weeks--which are busy blogger season with Christmas around the corner, I thought I'd do BEAUTY WEEK! For the next 4 days, I will be talking about some items I picked up during Cyber Week along with some surprise beauty mail I received. There will definitely be more to talk about once this week is over but let's start off with these products and posts, shall we? 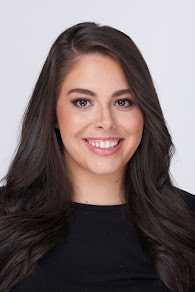 With all that being said, it's no secret that I love trying new beauty products and brands-- it's so fun to step outside my comfort zone and try things I may have not picked up myself. That's why I was pleasantly surprised a few weeks ago when I came home to an unexpected package from Borghese. 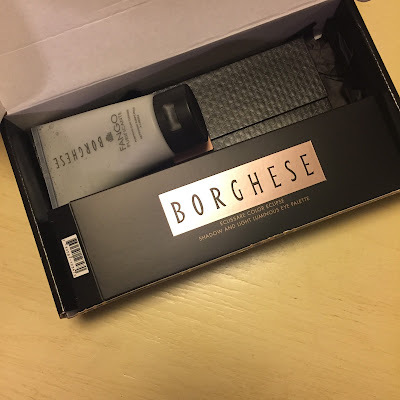 You'll remember I first received some Borghese products a few months back and this was a total surprise, filled to the brim with some amazing beauty products. Borghese is definitely a brand that not a lot of people talk about, in my opinion, especially in the beauty community. That's probably because it's not available in Sephora or Ulta. It's a shame though, because there are definitely some gems in the line. A few of the items I might gift away to friends and family since I have been feeling very overwhelmed by all my makeup, but a few items have already been incorporated into my beauty routine and I can't get enough! What I was most excited to see in the box? 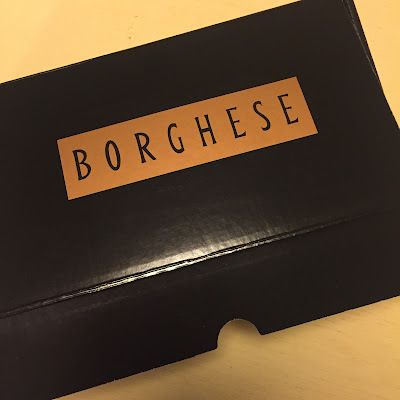 The Borghese Eclissare Color Eclipse Shadow & Light Luminous Eye Palette. It looks incredibly similar to the first Urban Decay Palette and is a straight neutral palette. 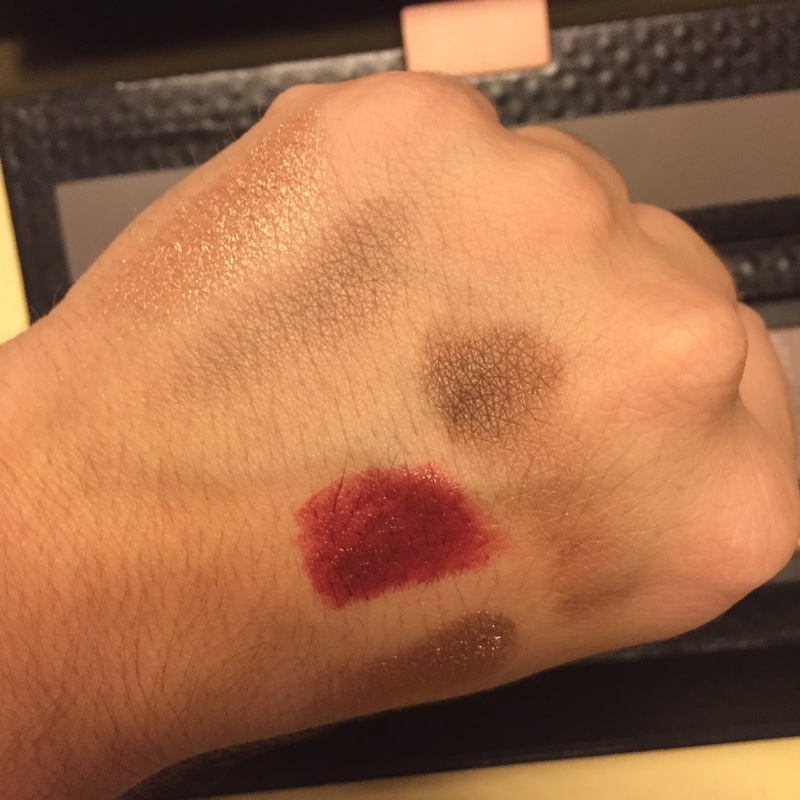 The shadows are beautiful and pigmented but once they're on the eyes, every color looks the same. It could just be me, I've had trouble with my eyeshadows lately. It is a gorgeous palette though and a great idea for a Christmas gift for someone who wants to get into beauty or is an expert. 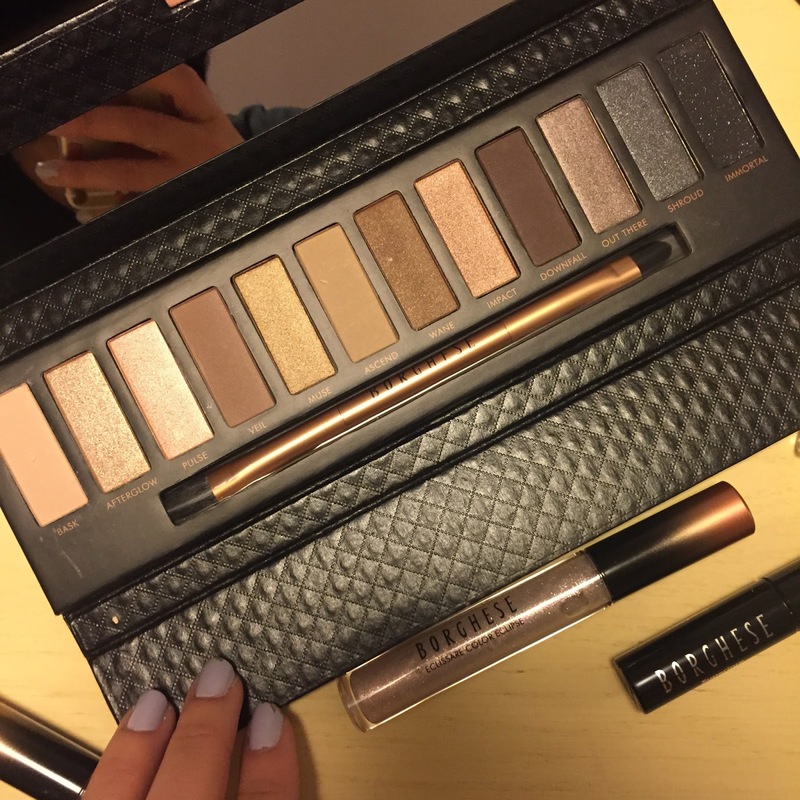 You could never have too many neutral palettes. The other item that I fell in love with the moment I saw it? The B Moisture Lipstick in Grappa. It's the perfect fall, plum shade and is super hydrating on the lips. The texture is unlike any other lipstick I have and I have to stop myself from wearing it everyday. I love vampy lips with simple face & eye makeup because it makes you look so put together without any effort. UGH I love! I also received two Color Gloss Lipglosses which are not my cup of tea. They are very sticky and filled with glitter and shimmer. They may make a nice top coat to a lipstick if you're looking for a tad bit of shine but these will probably be gifted away. Three items I haven't tried yet but seem pretty great and hard to mess up (but still may be gifted away) are the Borghese Face Primer, State of the Art Mascara, and Color Edge Eyeliner in Pitch Black. The Face Primer is smooth and doesn't have a silicone feeling so it would definitely feel hydrating which is great for the winter time. The mascara has a medium size wand and the shape is definitely what I go for. I'll probably give this to my mom though because she is in need of a new mascara. The eyeliner is a standard black pencil liner--I'm not picky nor do I have high standards for eyeliner so I'm sure it's great. The last item that was in the package and what I've fallen head over heels for? The Purificante Clay Cleanser. It's a grey cleanser that foams up really nicely once wet. It's supposed to deep clean your pores and my goodness it does just that! It leaves my skin smooth, soft, and incredibly clean. I usually use this at night when I didn't wear a lot of makeup and don't need an exfoliate cleanser; it works wonders! 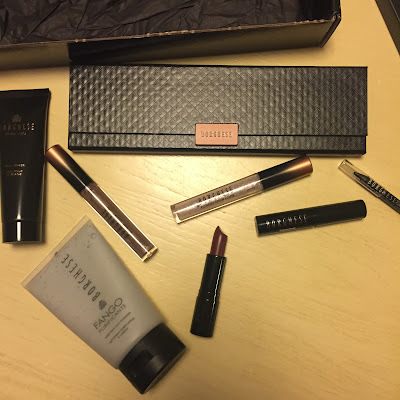 Borghese definitely has some hits and misses but it is a high end brand and they definitely have some great makeup -- but I think I am more partial to their skincare. It's amazing! Have you ever tried Borghese? Which beauty brand do you think is underrated?